If I did it, so can you. That phrase sound familiar? 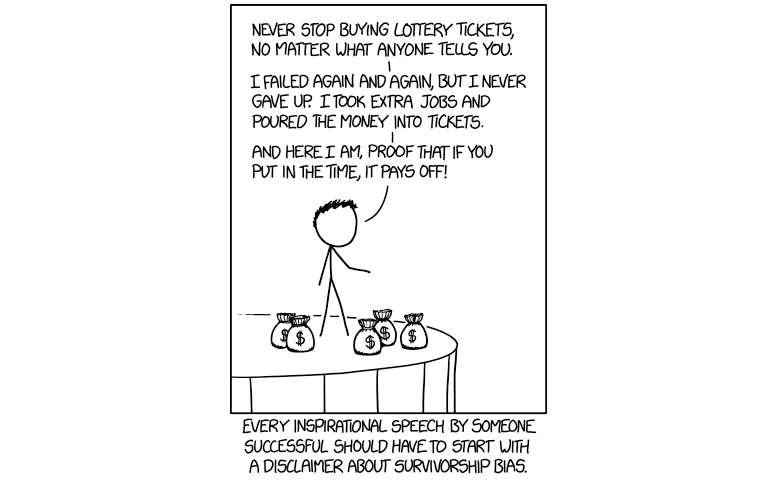 If you just work harder, if you only wanted it more, if only…Survivorship Bias can be dangerous. Hard work is definitely needed to gain success, but it’s not the only factor. By believing in this mentality we are automatically doomed into thinking if we don’t succeed then we’re failures. But the world isn’t so two-sided. There are plenty of options and ways to achieve the success you want. Want more? Subscribe to our show on iTunes! New episodes uploaded every Tuesday. Pam: Failed companies are excluded in performance studies, because they’re gone and they failed. Pam: We’re all told the bootstraps story, the American Dream story. We’ve spent so much time on this podcast talking about that and the idea of pulling yourself up by your bootstraps. This idea that we all live in this vacuum or this silo where we all start from the same place and have the same opportunities so “I just worked hard and that’s how I made it” and this implication that I worked hard and I’m here, which means that you didn’t work hard because you’re not here. Pam: You’re always right in hindsight. That’s basically what survivorship bias is. Is oh, looking back on all these things, I’m able to tell you that this is what worked when that’s not actually what worked that’s just what happened. Pam: “Hard work is a necessary condition for success, not a sufficient one.” -Sol Orwell …Hard work is the prerequisite for success. It is really putting in the time, putting in the effort. Pam: The biggest thing about deliberate practice is there needs to be a system in place where you understand the progress you’re making, and you can also pinpoint where you’re not making progress. Pam: I think the first thing in terms of you trying to figure out what you wanna get better at, or if you have a business idea and you wanna figure out if you’re making progress on it, is you have to figure out what you’re actually measuring. This is why we talk about why it’s so important to have cash flow projections so that you can measure month by month whether or not it’s growing in the way that you predicted that it would grow, because that’s one way to see if it’s working and that’s one way to help you decide if what you’re doing is working. Pam: If you don’t have an understanding of what you need to measure, than that’s the first thing you need to figure out. Pam: The phrase “work hard” is just as valuable as “exercise more and eat less.” It means nothing! …It’s this sort of blanket statement that people say when they don’t’ understand what they’re doing and they don’t understand how they got there.